Our fabulous 6 day vacation on Block Island ended Wednesday. 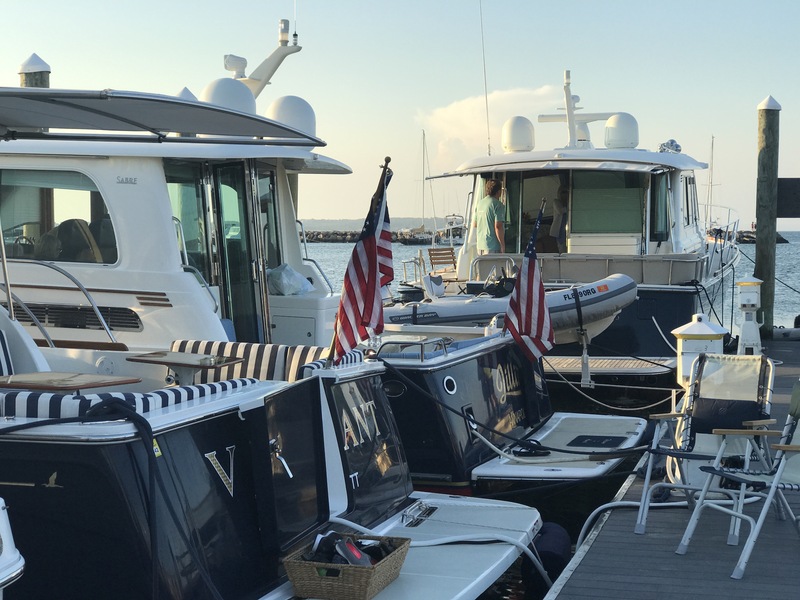 We awoke to “Sabre corner” with a beautiful 54 in the prime spot at Ballards Marina and a 42 tugged up next to Vigilant. 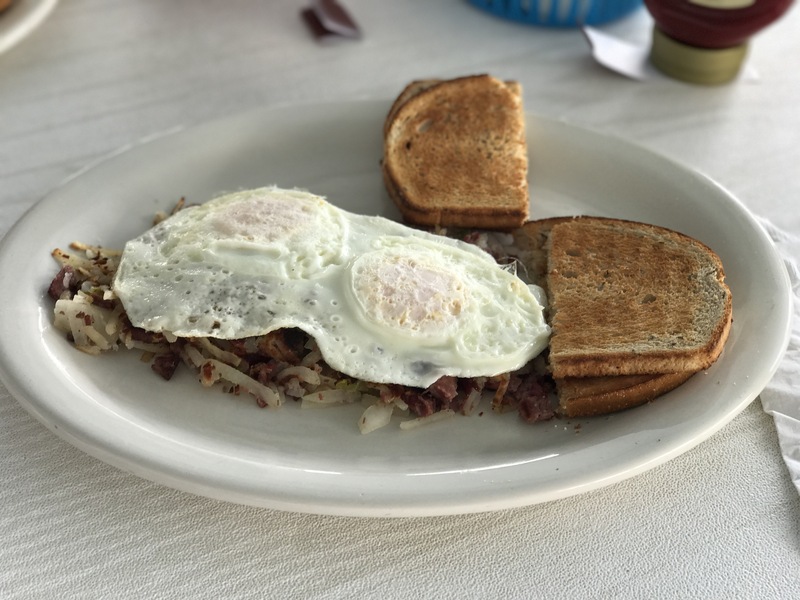 We returned to Ernies for our last breakfast on the Island and everyone but Mrs. Horne feasted on their award winning Corned Beef Hash. I’ve been searching for a video editor ever since I upgraded to Windows 10. For some reason, Microsoft decided to drop Windows Movie Maker and I’ve tried a bunch of apps and found nothing I like. Last night I noticed an iMovie app on my iPhone 7 Plus and decided to give it a try. Before I show you the video, I have to set the scene. We were literally wedged in between the Sabre 42 to starboard and the 41′ Carver to port. Rudy had to walk the right side out and Mrs. Horne had to hold us off the piling to the left as I “nudged” the 715 HP Cummins to pop us out. 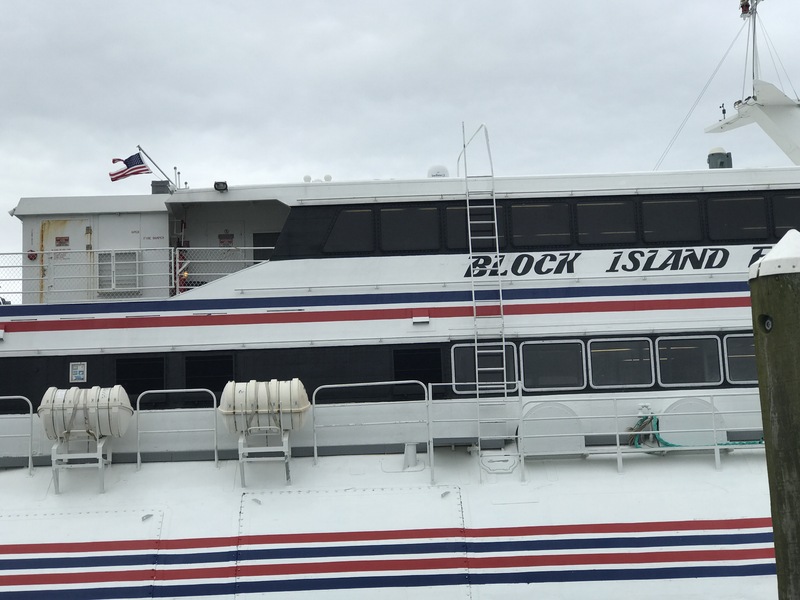 Just as I started out, the enormous Block Island Express ferry pulled in right in front of me. I no longer had room to turn right without hitting the ferry. I also knew there was a field of rocks lurking just below the surface to my left. Oh yeah, it was low tide! Vigilant was in the 3rd slip without room to turn right. But I pointed out that the ferry would probably be there for hours. And with that I pulled out, steered behind the ferry and then used the thrusters to spin us so I could back out. Oh yeah, I set the video camera up first to capture anything interesting that transpired. ​Following our smooth departure, we enjoyed a very pleasant 2 hour 15 minute cruise for the 55 mile ride back to Mattapoisett. I leave with so many memories and much material for future reviews. I’m also hoping to return for at least one night in August.